The present study examines how mean state biases in sea-surface temperature (SST), surface wind and precipitation affect model skill in reproducing surface wind and precipitation anomalies in the tropics. This is done using theoretical arguments, atmosphere-only experiments in the Coupled Model Intercomparison Project Phase 5, and customized sensitivity tests with the SINTEX-F general circulation model. Theoretical arguments suggest that under certain conditions the root mean square error (RMSE) of a variable can be related to its variance and its mean, which indicates a direct link between bias and skill. The anomaly correlation coefficient (ACC), on the other hand, is generally not related to either the mean state or its variance, as several examples document. Multi-model atmosphere-only experiments with prescribed SST warming suggest that both ACC and RMSE of surface wind and precipitation are rather insensitive to warming on the order of 4 K. When SST biases from a free-running control simulation are prescribed in SINTEX-F, the ACC of surface wind is almost unaffected in the equatorial Pacific and Atlantic, while that of precipitation decreases noticeably in some regions but also increases in others. The RMSE of both fields shows widespread deterioration. There is a tendency for warm SST biases to increase the signal-to-noise ratio and sometimes ACC as well. The results suggest that, in the context of atmosphere-only simulations, improving SST and precipitation biases does not necessarily improve the skill in reproducing anomalies of surface wind and precipitation. The authors would like to thank Prof. Shang-Ping Xie for helpful comments on the manuscript. 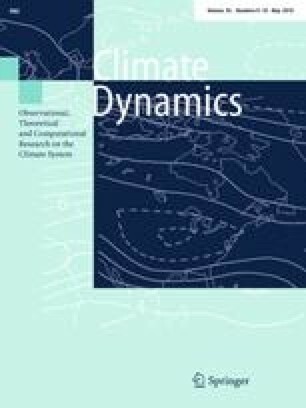 We acknowledge the World Climate Research Programme’s Working Group on Coupled Modelling, which is responsible for CMIP, the U.S. Department of Energy’s Program for Climate Model Diagnosis and Intercomparison which provides coordinating support and led development of software infrastructure for CMIP, and the climate modeling groups for making available their model output. The authors thank the two anonymous reviewers for their constructive comments, which helped to improve the manuscript.